Do you remember the Fokes Sentence Builder? Okay, I'm not THAT old, but we did have one buried in our clinic's closet in college. The box didn't look fancy and when you opened it up it was equally unimpressive. 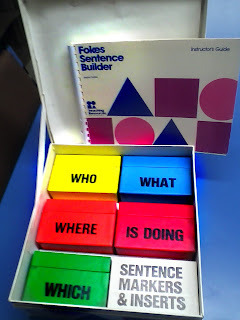 If you took the time, however, to actually read the book and figure out how the little boxes worked, it was a fantastic tool for sentence writing. Fast forward 10 or so years (okay, I am starting to get older), as I was cleaning out another closet, low and behold, what did I find? The Fokes Sentence Builder. Its colorful boxes and sentence markers were all intact. I hit the SLP jackpot! Okay, so some of us get a little bit excited. These things are hard to come by. I digress. So, what's the Fokes Sentence Builder? 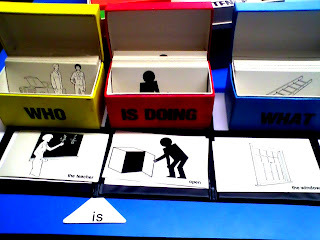 The Fokes Sentence Builder is a big box with six smaller boxes inside with hundreds of picture (and some words) cards inside that. Joann Foke's developed a systematic approach to teaching students how to construct sentences for readers and non-readers. 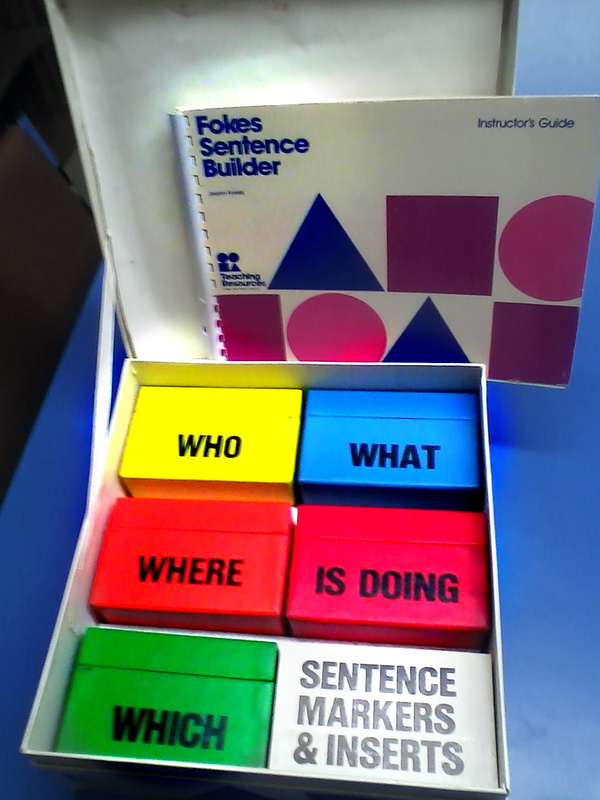 So that brings us to present time (by the way, the Fokes Sentence Builder came out the same year I was born--1976). Now we have all of these gadgets and advances that give us instant access to materials. Many speech therapists continue to use the traditional method of using paper and pencil tasks or flashcards with students as manipulatives to teach sentence writing (structure). Believe me, I still like to use these, but now that some of us are technology crazy (me), I like to venture out by using the SMART Board, computer, and iPad to teach the same concepts. What would be great? ...if there was a Fokes Sentence Builder app. Unfortunately, as far as I know, there is not. There are, however, lots of other similar apps and programs out there that can do the same thing. So, I thought I'd share the 21st century versions of the Fokes Sentence Builder with you. This app allows users to practice creating grammatically correct sentences by building them from word wheels. The app features 100 pictures and also keeps statistics to show progress. This app is pretty cool in that it color codes the who, what, where, and why parts of the sentence to help the learners understand how basic sentences are put together. The app has over 150 pictures to use when building sentences. Crick Software developed this app after its success with its Clicker software developed pre-iPad. This app is pretty extensive (it also costs quite a bit more) as it allows you to choose from a variety of levels of sentence structure. One of the cool features is that it allows you to use your own pictures. This app, from initial appearances, mimics the Fokes Sentence Builder in the way that it is structured. Used with Mayer Johnson's Picture Communication Symbols (PCS), this app requires users to construct sentences using picture symbols paired with words. If you know the Fokes Sentence Builder, you know that this is the second level after "Who + is doing." Now, I haven't had time to play with all of these apps. I should probably disclose that. I really wanted to see what was out there to supplement the Fokes Sentence Builder. This would be great additional practice for students during independent time. Let me know if you have used these. What did you like and dislike? What are your favorite apps that you use for students who are "building" sentences?